The ceremony will feature Naruwan Taiko Drummers and the Port of San Diego’s Harbor Police Department Honor Guard. Speakers confirmed who represent the partnership and commitment of this project include Port Chairman Bob Nelson, Port Commissioner Marshall Merrifield, Acting Port President/CEO John Bolduc, San Diego Mayor Kevin Faulconer, San Diego City Council President Todd Gloria and Civic San Diego Chair Cynthia Morgan. Highlights of the North Embarcadero project include dramatic, swooping streetlights (imported from Poland) along the new “Grand Hall” along West Broadway; lush jacaranda trees, whose purple blooms are synonymous with San Diego because it's the city’s official tree; iconic public art by the internationally acclaimed artist Pae White incorporated into the design for new pavilions, café building, information center' and a new bathroom building that is also a Pae White art piece! The design team is led by Project Design Consultants and includes Civitas, Spurlock Poirier Landscape Architects and Joseph Wong Design Associates, among others. Dramatic, swooping streetlights can be seen lining the new “Grand Hall” along West Broadway. Lush jacaranda trees (the tree of San Diego!) donated by the Village Garden Club of La Jolla adorn the area with purple blooms. A 105-foot-wide public esplanade provides an inviting place to walk. 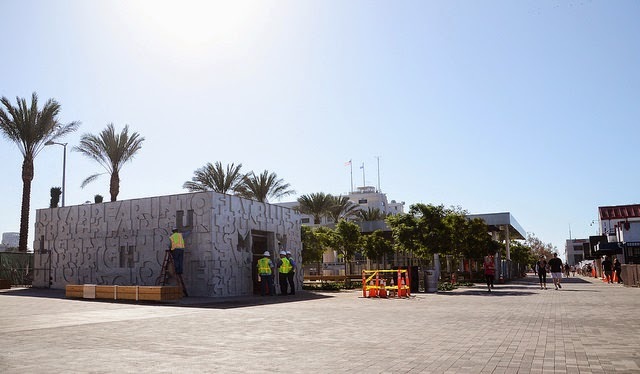 There’s also a new information center, and a new café building where a a Carnitas' Snack Shack restaurant is expected to open as early as Spring next year. 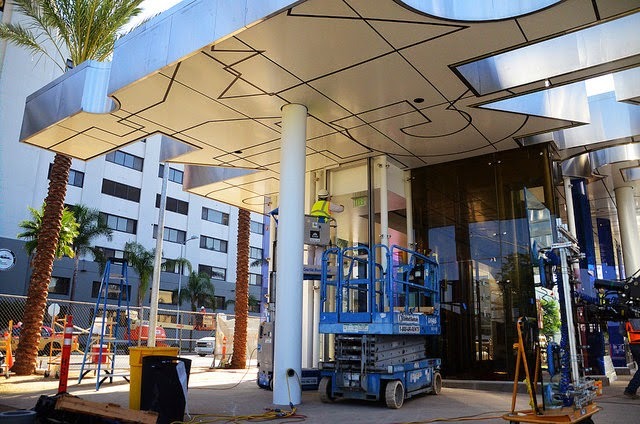 Iconic public art by the internationally acclaimed artist and Californa-native, Pae White, is incorporated into the design for the new pavilions, café building and entertainment center. The new restroom building is also a Pae White art piece. The project also includes significant improvements to roadways, utilities and storm water systems. One example of these improvements is a water quality band. 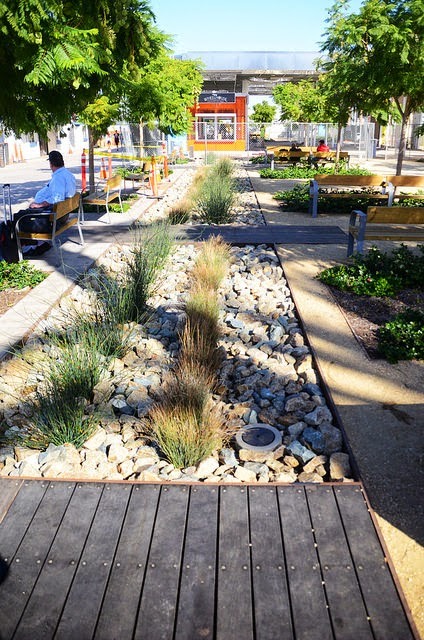 It is a natural water filtration system, created by layered mulch, soil and gravel. Water runoff from the street and sidewalks enters the band and trickles down through the layers, allowing only clean water to go into San Diego Bay. This year has been highly significant for San Diego’s waterfront. 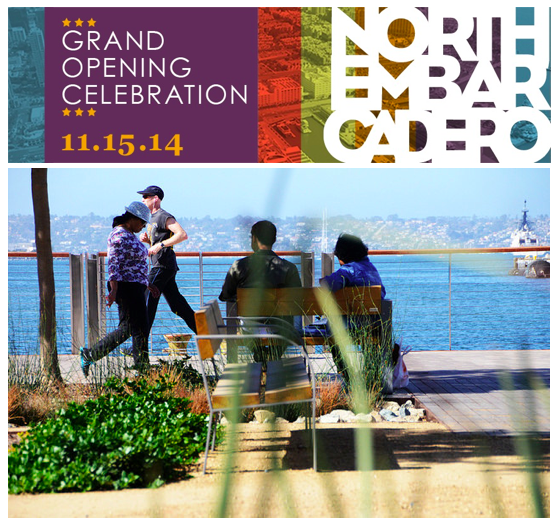 Not only does the North Embarcadero have a new look, but the County of San Diego’s waterfront park opened May 10. Construction is underway at Lane Field with a hotel and a new public park, adding to the amenities to in the area. Parking for the community event is available at metered parking spots and paid parking lots near the event. Attendees are encouraged to carpool or take public transportation. The San Diego Trolley has convenient stations with service to the Harbor Drive and Embarcadero areas with free and paid parking lots. 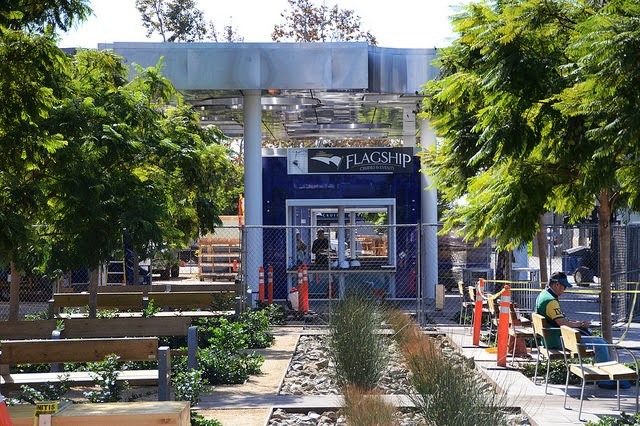 The new North Embarcadero is located at 1000 North Harbor Drive in downtown San Diego. For more information, visit portofsandiego.org.